All the fun Phil and Matt have been having with their X-Wing adventures has inspired me to do something of my own relating to star ships and space battles, although rather than Star Wars being my theatre of war I returned to one of my favourite games – Battle Fleet Gothic. I’m lucky enough to own a sizeable Imperial fleet with every ship in the Rulebook represented at least once, along with a decent supporting fleet of Space Marines, but something I never invested in was the array of orbital defences and installations that were available at the time. The problem with correcting this regret is with Battlefleet Gothic models no longer available from Games Workshop, the second-hand market is the only way to now obtain these models – and with some of the rarer kits selling for eye watering prices this isn’t always a viable option. 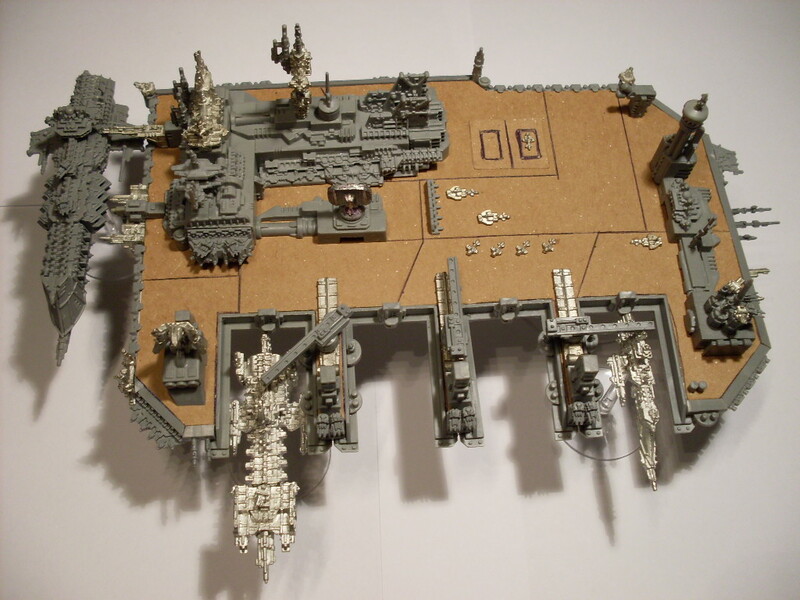 An example is the Ramilles class Star Fortress from Forgeworld – always a model I’ve wanted to own but it never found its way into my possession – the only one I’ve seen on eBay is over £200. As much I want this model I’m not going to part with that sort of money to own it, so instead I will go down the not often walked path of scratch building my own sizeable space installation. However, building your very own version of Ramilles Star Fort is a daunting proposition and given the number of components it would consume you may even be better off just splashing the cash for a real one. Plus, it’s not always a good idea to attempt to create an exact replica of an existing model as your efforts will mostly be judged on how well it matches the original rather than its own merits. So a Space Station of some description was on the cards and after flicking through the Battlefleet Gothic rulebook I came across the Space Dock built by Dave Andrews and thought for a first foray I’d build my own version of this superb model. It was a good size and didn’t need the uniformity of components a perfectly symmetrical piece would require, letting you just do your own thing as long as it looked cool. 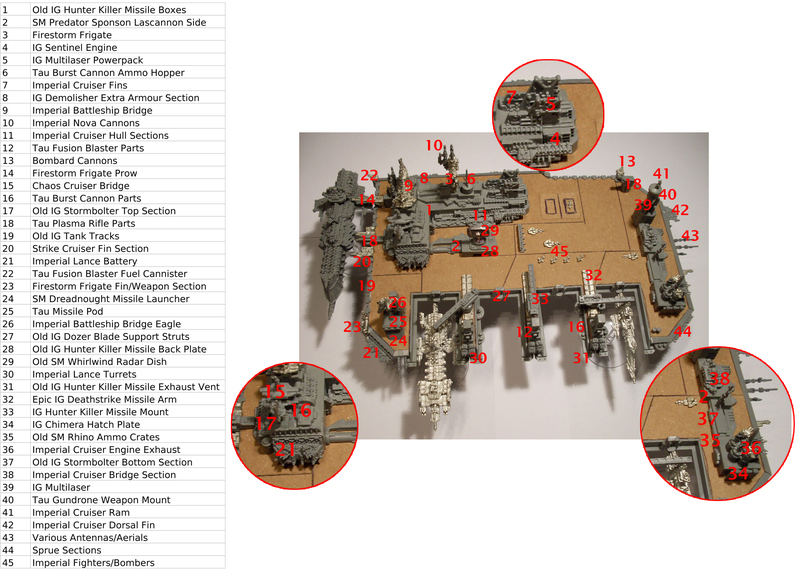 I sifted through my bits box and came up with a ton of components with the required level of detail, and after throwing in an Imperial Cruiser frame I was getting genuinely excited over how the project was shaping up. The key components turned out to be the old Imperial Guard Dozer Blade support arms which were perfect for the docking bays, and really set the size for the whole piece. I experimented with a couple of different lay outs like having two bays on either side with the complex at one end, but the demands of that symmetry meant the single row with the main complex off to one side was the better option – that Dave Andrews knew what he was doing. I spent a long while playing around with all the parts before I started gluing things together, and as structures started to emerge from the pile of pieces I was started to push them into specific roles. Aside from the ubiquitous Main Complex, there’s the adjoining Communications Array, four Docking Bays with three Repair Pylons, Control Tower Complex with adjoining Flak Tower and finally the Eagle shaped Precinct House. I have my favourites and my not so favourites but all in all I was very happy with the amount of detail and purpose I was able to fit into each one – with a paint job hopefully only going to add to the intricacy of the buildings. It’ll be torture painting the thousands of little lights but it’ll be worth it. I hope. The actual structure of the piece was just a piece of foam board I had lying around with a dissected layer of smooth card over the top and edged with odd lengths of sprue. An extra layer underneath gave it enough strength and then some plastic panels glued on gave a solid socket for the two flying bases to plug into. It’s about 98% done construction wise as I’m going to add a few teeny tiny details to the deck like storage areas, crate stacks and the like just to give it a bit more life and usage because it’s looking slightly too sterile right now – for a Space Station. And maybe some more antennas, you know, because you can never have enough of those. Have a look for yourself and see what you think. The image shows most of the pieces I used but there’s more that are either obscured or too obscure to mention. I found Tau parts really useful, particularly their Crisis suit weapons – well, all weapons in general really as they have a really handy combination of intricate machinery and smooth surfaces which are perfect. I almost found as much enjoyment at discovering an interesting part that could be used as I did in building the thing – and I like building things, a lot. I thoroughly enjoyed the building phase and I hope that by showing the model pre paint job it can demonstrate how all manner of odds and ends can be combined into something more special. Your bits boxes are treasure troves, use them, they are your friends. They don’t get good overnight, they need feeding to reach their potential, but if you’ve been doing the hobby for as long as I have you forget where half the stuff came from and it becomes an adventure in itself – just be prepared to lose an hour or two and make a bit of a mess. I now need to do the model justice with its paint scheme, but I’m not too sure which way to go. I was thinking a military grey and black/dark grey combination to give it a functional look but I’m open to suggestions – maybe a poll can decide? Huge thanks for posting this and also naming the parts! Over the last few months I’ve been collecting odd pieces and components and adding them to the bits box. I’d also like to build a space station like yours and Dave Andrews’. I’ve been trying to find pieces to use as repair cranes for ages, even looking at servo arms from tech marines! The missile rails look perfect, as do the tank tracks for edging the station. They have been my main things to solve and whilst I do like the weapons battery plates from the Battlebarge I don’t plan on chopping many of those up! Managed to find some spares on eBay as well as the bridge sections. I’ve found myself taking heavy weapons from devastator squads, the cables/fuel lines you may find useful to represent power conduits to docked cruisers? Also, the power pack from the IG Sentinel multilaser would look good as a power facility, I’ve got some that I plan to use, the size seems to fit in well to scale. I have found the tau weapons useful too, plenty of ideas for them! Another tau component I found inspirational was the maneuvering thrusters for the drones on the sun shark bomber/strike fighter. The large end is just the right shape and size for a launch bay, I’m thinking of putting one in polystyrene and making an asteroid base. As for colour schemes, a lighter one would probably work best, so it stands out on the table and doesn’t get washed out against the black. You can probably also appreciate all the detail of the components more. It would be a shame to lose this after you’ve put so much time and effort into how it all looks.